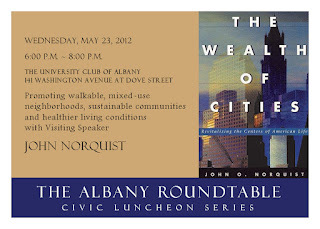 John Norquist, President and CEO of the Congress for the New Urbanism, will be the featured speaker at the Albany Roundtable’s Annual Meeting on Wednesday, May 23, 2012. The event is open to the public, and will be held at the National Register-listed University Club of Albany, 141 Washington Avenue at Dove Street. The reception will take place from 6:00 – 8:00 p.m., and will feature a social hour with cocktails and hors d’oeuvres, a short update on the Albany Roundtable Civic Luncheon Series and a presentation by the visiting speaker. Tickets are $35. The Congress for the New Urbanism (CNU), based in Chicago and with chapters around the country, is the leading organization promoting walkable, mixed-use neighborhood development, sustainable communities and healthier living conditions. John Norquist’s work promoting New Urbanism as an alternative and antidote to sprawl’s social and environmental problems draws on his experience as big-city mayor and prominent participant in national discussions on urban design and transportation policy. Norquist served as Mayor of Milwaukee from 1988-2004. Under his leadership, Milwaukee experienced a decline in poverty, saw a boom in new downtown housing, and became a leading center of education and welfare reform. He oversaw a revision of the city’s zoning code and reoriented development around walkable streets and public amenities such as the city’s 3.1-mile Riverwalk. Named a Governing Magazine Public Official of the Year during his tenure, Norquist also received the Bacon Prize, named for visionary Philadelphia planner Ed Bacon. At CNU, he has joined local activists in numerous cities as a key champion of plans to replace freeways with boulevards. A leader in national discussions of urban design and educational issues, Norquist is the author of The Wealth of Cities, and has taught courses in urban policy and planning at the University of Chicago, University of Wisconsin-Milwaukee School of Architecture and Urban Planning, and at Marquette University. At the same meeting, the Albany Roundtable will present its Good Patroon Award to Capital District Community Gardens for their efforts to improve neighborhoods through community gardening, healthy food access and urban greening programs for nearly 40 years. The Good Patroon Award was established by the Albany Roundtable in 1988 to recognize outstanding contributions to the community by institutions and individuals. The Albany Roundtable’s previous Visiting Speakers have included Janet Flammang (The Taste for Civilization); Colin Beavan (No Impact Man), Jaime Correa (planner, architect and professor at the University of Miami); Stan Eckstut (NYC architect, Battery City Project); Tony Hiss (Project for Public Spaces); Robert McNulty (Partners for Livable Places); Paul Pritchard (National Parks and Conservation Association); Richard Bradley (proponent of Downtown business districts); Ray Oldenburg (The Great Good Place); James Howard Kunstler (author and new urbanist); Jane Holtz Kay (architecture critic, author of Asphalt Nation); Joseph P. Riley (Mayor, Charleston, South Carolina); Richard Reinhart (Buffalo Place); and others. Tickets for the reception must be purchased by Friday, May 18. Download the RSVP card here. 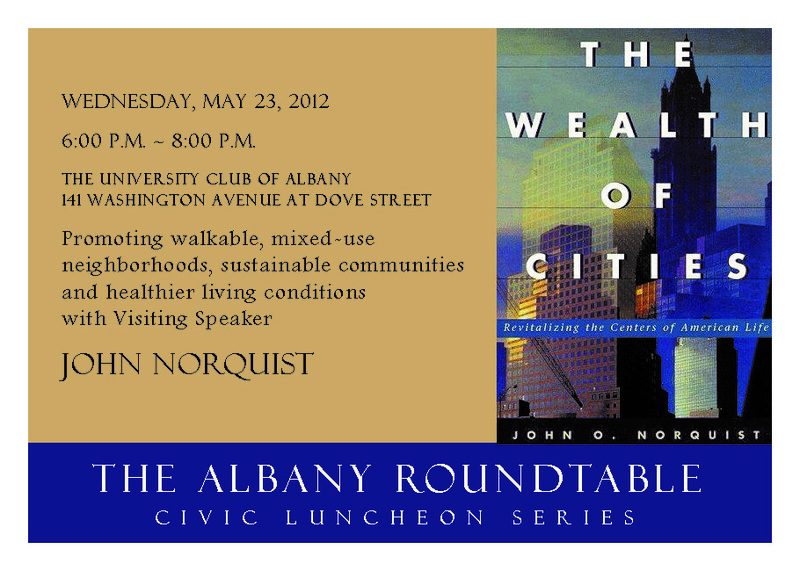 For more information, visit www.albanyroundtable.com, email albanyroundtable@yahoo.com or call The University Club at 518-463-1151.